One of the largest ever GWE RAPTOR anaerobic biological transformation energy crop/ waste-to-energy plants is being installed by clean energy specialists Organic Power, at its new green energy facility in Vega Baja, Puerto Rico. When fully operational in mid-2018, it will produce 2.055MWe, making it one of the largest RAPTOR (Rapid Transformation of Organic Residues) installations worldwide and the latest of a series of more than 200 successful GWE biogas utilisation plants for clients worldwide. The Vega Baja plant – in integral part of a broad grid improvement programme in the northeast Caribbeannation – is currently undergoing mechanical and installation works, and is still on schedule despite two horrific hurricanes, Maria and Irma, hitting the area within the last six months. Organic Power – whose mission is to deliver emissions-free or neutral electrical generation capacity which can displace fossil fuel generation at meaningful scale – will use the GWE energy crop and waste-to-energy plant to convert Napier Grass energy crops mixed with wastes into biogas, which can be used for electricity production. GWE Chairman and Chief Executive Officer Jean Pierre Ombregt said the new plant makes a compelling case for the use of proven high efficiency anaerobic biological waste treatment plants such as RAPTOR in State grids and private green energy programmes, where they have been proven to displace fossil fuels and enhance profitability for companies using them. “Not only will Vega Baja provide stable base load power while displacing polluting fossil fuels, but also it will clearly demonstrate how biological transformational technologies can complement solar and wind power in achieving green energy objectives,” he said. GWE’s RAPTOR is a powerful liquid-state anaerobic digestion process that converts almost any biodegradable waste and/or energy crop into biogas, which later can be utilised at the clients’ plants to save the heat and electricity consumption. It consists of enhanced pre-treatment followed by multi-step biological fermentation. 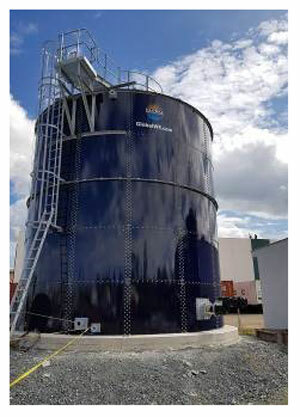 In the Organic Power application, it is integrated into a process that begins with waste reception and conditioning, then thermophilic hydrolysis through an acidification reactor (TAR), ANAMIX digester and post-digester, BIOSULFURIX biogas desulphurisation, GASODRIX biogas drying, biogas use in a CHP (Combined Heat and Power) unit and sludge dewatering using a screw press. “Organic Power is a respected clean energy provider with a strong emphasis on sustainability and renewable energy. Using our latest GWE waste-to-energy technologies, our RAPTOR system can provide them with 23,640Nm³/d of biogas, corresponding to 2.055MWe or 10,350kg/d of fuel oil,” said Ombregt, whose green energy technologies have received global recognition, including an IChemE green energy engineering award. The RAPTOR process consumes a high level of the potentially environmentally harmful Chemical Oxygen Demand (COD) content of the waste, which comprises content of natural origin that can be broken down into biogas by anaerobic bacteria. At the Organic Power plant, this equates to 45,000kg/d COD, and 240m³/d of waste. Global Water Engineering has successfully built and commissioned over 200 biogas utilisation plants for clients worldwide over the past 15 years. Such plants produce green energy from pollution present in wastewater, using high-performance anaerobic bacteria to digest the dissolved and suspended organic matter, which is converted into biogas, a mixture of methane and carbon dioxide. Biological waste from a wide range of specific user types including universities, grocery stores, restaurants, food transporters, hospitals, sports arenas, large office complexes, commercial buildings and large residential complexes. “The diversity of the material to be processed means a range of different RAPTOR pre-treatments are available, to allow the highest possible conversion efficiency. The technology involved in this project is widely applicable to any plant looking to turn waste into green energy,” said Ombregt.